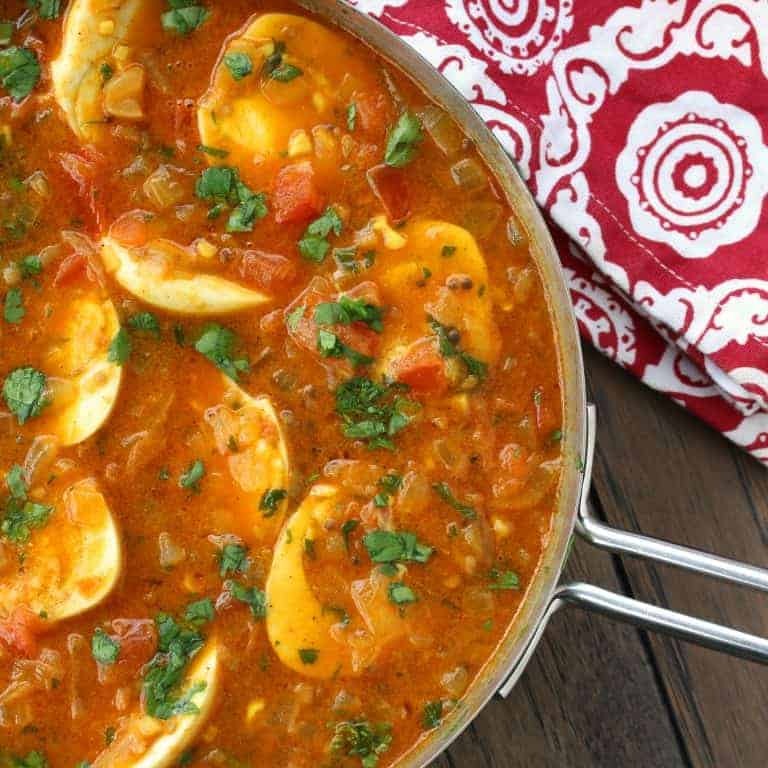 This southern Indian egg curry features a variety of wonderfully flavorful spices and the delicious creaminess of coconut milk. Naturally meat-free, it’s one of India’s most popular curries! 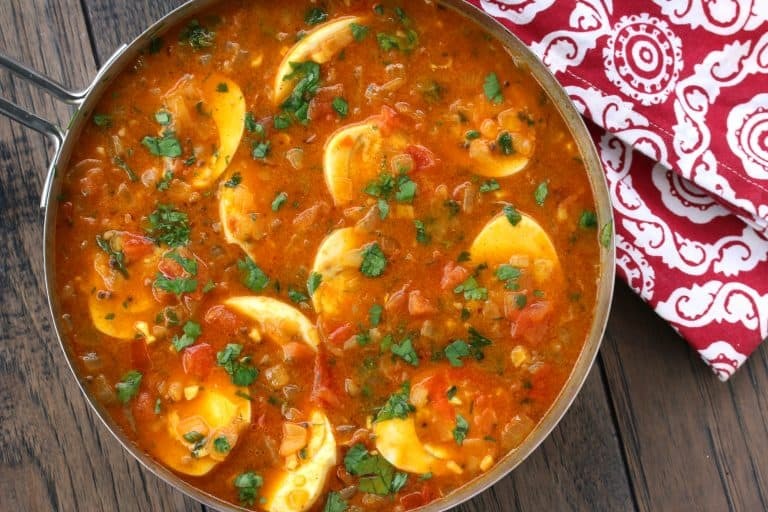 This is a Kerala-style egg curry, meaning its flavor profile hails from the southern part of India where coconut milk is widely used. It not only enhances the texture but provides a wonderful sweetening balance to the spices. 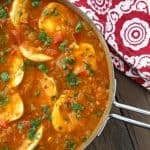 I like to include meatless dishes in my weekly meal plans and this egg curry is a delicious meal to include in your rotation. 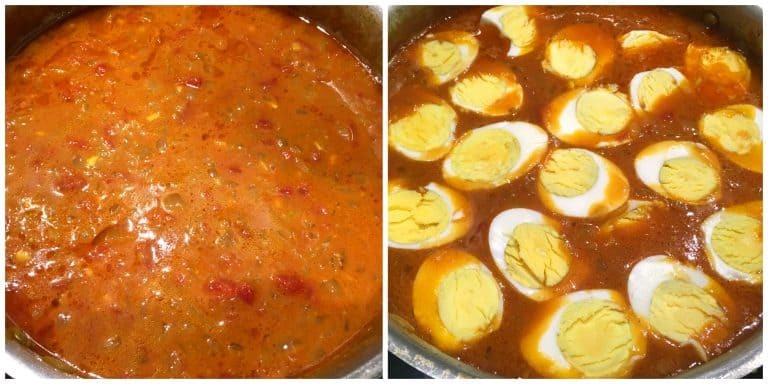 Featuring eggs, it provides a good amount of protein and the flavor of this curry is so fantastic that even avid carnivores won’t miss the meat! Southern Indian food is largely vegetarian and whatever anyone feels may be missing from the lack of meat is more than made up for in flavor. This curry can be made well in advance (and the flavor will only get better). Simply reheat it and then add the cilantro and eggs just before serving. Done! A quick weeknight meal ready to go! 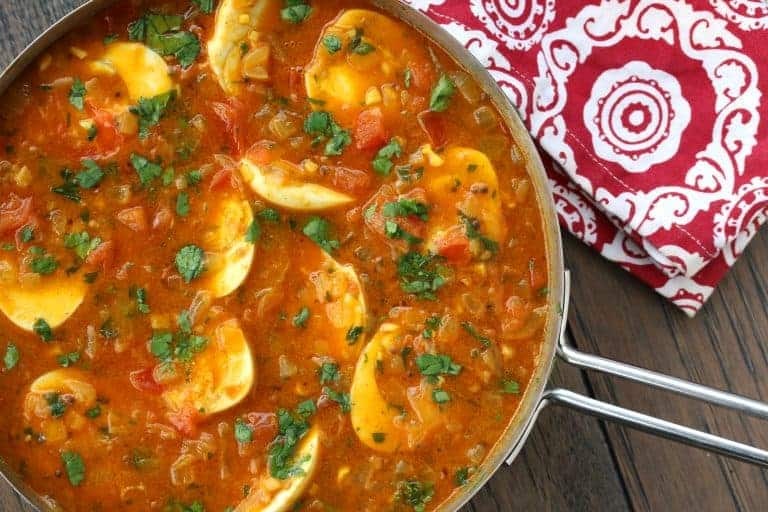 If you love authentic Indian food and like to include meatless dishes in your meal plans, you’ll love this egg curry! Heat the coconut oil in a pan over medium-high heat and fry the mustard seeds, cloves, cinnamon and cardamom just until fragrant. Be careful not to scorch them. Add the onions and fry until lightly browned, 6-8 minutes. 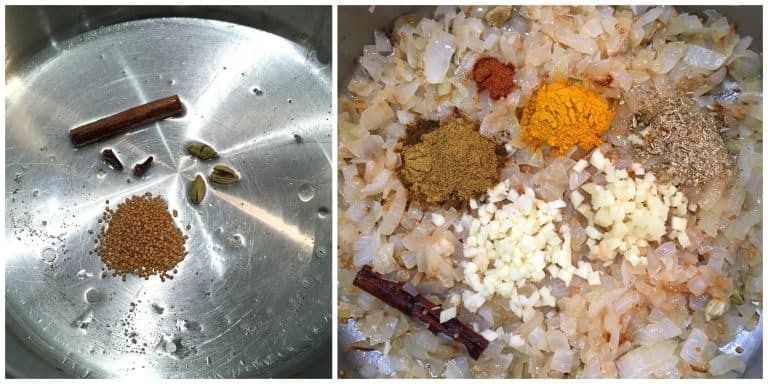 Add the garlic, ginger, chile peppers, garam masala, coriander, turmeric, ground fennel, curry leaves and Kashmiri chile powder and cook for 2 minutes. 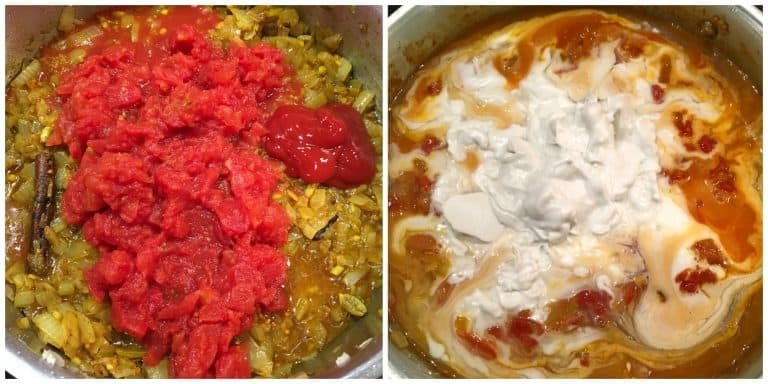 Add the tomatoes and ketchup and cook for 4-5 minutes, stirring frequently. Add the coconut milk and salt and bring to a boil. Reduce the heat to medium-low and simmer, covered, for 20 minutes, stirring occasionally. Stir in the cilantro. Carefully add the eggs, cut-side up, and simmer uncovered for another 3-4 minutes to heat through. Serve with your choice of naan, chapati, paratha, bhakri, rice, pulao or biryani. This southern Indian egg curry features a myriad of flavorful spices and the wonderful creaminess of coconut milk. Naturally meat-free, it's one of India's most popular curries! Add the coconut milk and salt and bring to a boil. Reduce the heat to medium-low and simmer, covered, for 20 minutes, stirring occasionally. Stir in the cilantro. Carefully add the eggs, cut-side up, and simmer uncovered for another 3-4 minutes to heat through. So flavorful and delicious! Thank you!! This looks SO flavorful! Yum! This looks like a wonderful comfort food recipe. I’d love to try it! Wow, this recipe is so tasty! oh my this curry looks amazing! I love how saucy it is! I love trying authentic dishes! You’ve made this one look easy and packed with flavor! Oh how delicious this dish looks! Need to try this immediately, love it! SO comforting! I need to give this a try! How creative! I have never had anything like this! I have to try it! This has SO much flavor! My husband will gobble this up! Very tasty! A simple recipe that could produce an awesome result. Thank you so much for sharing. Wonderful, thanks so much, Annie!